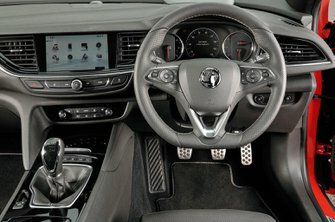 Used Vauxhall Insignia Review - 2017-present | What Car? What's the used Vauxhall Insignia estate like? There was a time when the estate car was all the rage, but demand for higher-riding SUVs has eroded its popularity. 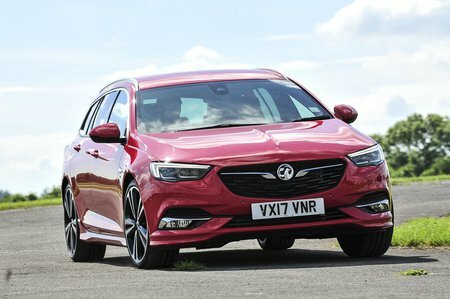 To combat this, Vauxhall has given the Insignia Sports Tourer a name that bears no association with the word estate and given the car some bolder styling to make it stand out. There’s only so much you can do with the look of a big load-lugger because its primary objective is to carry lots of stuff. But, to disguise the height at the rear, the chrome strip running above the window line continues down to meet the rear tail-light, drawing your eyes down from the roof and giving the overall design a sleeker profile and less of the 'box on wheels' look. It’s a much smarter way of improving the estate shape than the sloping roof of the Peugeot 508 SW, which really does compromise cargo room. It's an easy boot to get things into, as well. The opening is a square shape and there’s only a shallow bumper to lift items over. It’s particularly useful because there’s less chance of scratching the paint on the bumper. Luggage capacity is impressive and it will swallow five people's holiday gear with ease, although rivals such as the Skoda Superb Estate and Volkswagen Passat Estate have bigger boots with the seats up or down. That said, the Insignia Sports Tourer hits back with generous levels of standard equipment. Every Insignia Sports Tourer comes with lane departure warning and traffic sign recognition – a thoughtful touch since some rivals only offered these as options. There’s also an emergency response button that you can press for assistance if you’re involved in an accident. Every car comes with Vauxhall's OnStar concierge service. This brings online connectivity, a 4G wi-fi hotspot and a connection to a dedicated call centre, whose operatives can download a specific Google map route you’ve requested directly to your sat-nav (provided the infotainment system you have has this facility). This service is provided for free as part of a 12-month trial when the car is new, but you can extend this for an annual fee. To drive, the Insignia Sports Tourer is hardly exciting, but most won’t be looking for driving thrills in an estate car. The handling is safe and secure, with well-weighted steering that allows you to accurately place the car. It’s very stable on the motorway and allows you to relax on long journeys without having to make lots of tiny steering corrections to keep it heading in a straight line. This is accompanied by very little wind noise and comfortable, supportive seats.